Juicero brings cold-pressed juice directly to your kitchen. This story originally appeared on Wallpaper.com. It’s a revolution in a juice glass. The Fuseproject team, headed by Yves Béhar, have spent the past two years bending their brains around a project designed to bring fresh, organic, cold-press juices to our tables with all the hi-impact nutrition of an industrial pressing but none of the will-weakening fuss, bother, and profuse pulped vegetable matter. Practised at producing pioneering gadgetry, Fuseproject nevertheless faced a challenge with this ground-breaking concept, dreamt up by hemp-wearing, juice-loving, vegan entrepreneur, Doug Evans. For a start, condensing 3-4 tons of pressure into a sleek, compact domestic appliance is no easy feat. 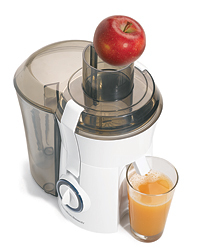 But the ambition went further than simply making a counter-top cold-press juicer – Evans envisioned a whole farm to glass organic juice package for the home, that delivers pre-selected, carefully combined triple-washed and diced fruit and veg, and cleans up after you too. The sealed packs are prepared in California and shipped around the States. Once used, the crushed packs can be discarded without any of the pulped waste seeing the light of day.Think of the no-mess single-cup-in-a-cartridge coffee machines, operating at the touch of a single button and you’ll be part way to understanding the Juicero. But additionally the juicer is smart – it reads each pack’s unique QR code to reveal the produce origins, nutritional value, ensure peak quality and track usage. Used with the Juicero App, you can schedule and change pack deliveries and track your current Juicero pack "inventory". Fuseproject’s design is feistily fuss-free, the white exterior made from aircraft-grade aluminium and the interior featuring a continuous rubber lining, made from a mix of flexible silicon and triton that can withstand extraordinary amounts of pressure while allowing the free flow of liquid. While Evans, who has been consuming raw organic fruits and vegetables for more than 17 years, is making it his mission to bring plant-based nutrition to more people so they can "live their best lives" Fuseproject’s goal was to "balance the organic with the mechanical, creating a luxurious yet approachable kitchen device." Though as yet limited to those with pretty deep pockets (the Juicero costs $699), living in California (it will be rolled out further afield later in the summer), both goals should soon be achieved.